I was pumped for DOCTOR STRANGE (2016), which I expected to love. Instead, I only liked it. Not that it’s bad, but compared to my hopes it’s very disappointing (cover by Steve Ditko, all rights to current holder). There may be some minimal spoilers here. On the plus side, the special effects are awesome, both technically and imaginatively. I read a quote somewhere that they wanted to make every scene so weird it would be the craziest thing in any other movie, and I think they succeeded. Reality bends and twists, and there are a couple of scenes that perfectly capture Steve Ditko’s Silver Age work on the strip. The acting is mostly good: Benedict Cumberpatch is good as Stephen Strange, the arrogant thinks-he’s-god physician whose hands are crippled by a car accident. Unable to work as a neurosurgeon, he eventually turns to the mystic Ancient One for a cure and winds up as an apprentice instead. As the Ancient One, Tilda Swinton makes an awesome mystic mentor, but if they’re going to go with a white person, why then send Stephen to the “mystic east” to meet her? As The Mary Sue notes, we get the stock orientalism with the Nepalese setting, but cut out a major Asian role. Chiwitel Ojiofor plays Baron Mordo, who convinces the Ancient One Stephen as the potential to be a mage. Benson Wong does a good job in the small role of the gruff librarian Wong. Rachel McAdams does a good turn as Stephen’s colleague and former lover, Christine Palmer. The only really bad part is Mads Mikkelson as the evil Caecilius, who wants to deliver us all to the dark lord Dormammu. Mikkelson’s just as ineffective here as he was in Casino Royale. And I really like the ending. It fits how Strange worked in the early Ditko/Lee stories, where he’d go up against overwhelming power and triumph by out-thinking the bad guys. So what went wrong? For starters it’s an origin film and expands the eight-page origin of Dr. 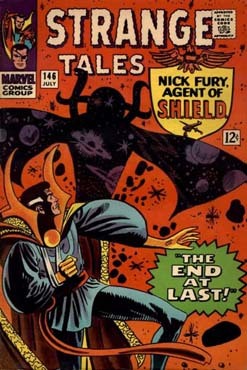 Strange (Strange Tales 115 if you’re curious) into well over an hour. We start with medical drama showing us he is indeed Stephen Strange, the world’s greatest neurosurgeon. Then we get what felt like an eternity of training montages, which even with magical lights flashing around Stephen’s hand still look like a martial arts movie. By the time Stephen goes into action for real, I’d lost interest. Dr. Christine Palmer is the kind of character who gives rise to the phrase “obligatory love interest.” She’s there so Stephen can have a love interest, but her presence after he leaves the hospital feels very forced, particularly when he has to come to her twice for medical help. And quite simply I don’t like how they write Stephen himself. I constantly hear Robert Downey Jr.’s Iron Man voice coming out of his mouth, arrogant, snarky and irreverent, constantly bending the Ancient One’s rules when he sees the necessity. That’s not at all true to his character in the comics, which was always respectful; and even if I hadn’t read them, I think I’d be annoyed because one Tony Stark in the MCU is enough. Making him merely an arrogant smartass also softens his redemption arc. Part of what I like about Dr. Strange’s origin in the comics is that he’s not just arrogant, he’s a serious jerk, who can brush off a request for life-saving charity work (in a later retelling) by saying that “hands like mine don’t apply a bandaid for less than five fingers.” Tony may be self-centered, but he has friends; I’m not sure Strange did. That would have made for a stronger and more distinctive character. I still liked a lot of the film, obviously. But like I said, I thought I’d love it, and I don’t. I so agree with your take on Dr. Strange. I came to this movie with no knowledge about the Dr. Strange story as I didn’t read those comics growing up (strictly an X-men girl). I was excited, too, by the previews. It was a good movie visually–I especially enjoyed watching it in 3D which I rarely do. But, it did lose some steam and fall into predictability by the middle of the second act. I really wish they would have lingered more on the training scenes and exploration of the nature of reality. No one could master those gifts so quickly. I loved those scenes where he is ‘astral projecting’. I love Tllda Swinson (as an actress and in this role), but agree that since they cast her in the lead, they didn’t need to go to Nepal and play up “Asian exoticism”. Why not New Jersey, Tampa or Salt Lake City to find the Ancient One? I also agree about the Christine Palmers character. There is a trend of superhero male characters being jerks and then being able to just say sorry and make everything right with the women in their lives. Please! I probably will not see the sequel until it gets to Netflix or Prime. Yes the implication in the comics was that his training took way longer. And I agree with you, having the Ancient One operating out of Jersey City or Pittsburgh (or wherever) would have been great.